And Yet They Deny: Eugenics In Action - "Sir David Attenborough Warns That Humans Are 'A Plague On The Earth'"
Eugenics In Action - "Sir David Attenborough Warns That Humans Are 'A Plague On The Earth'"
The 86-year-old broadcaster said the negative effects of climate change and population growth would cause disaster within next 50 years. He told the Radio Times: "It's coming home to roost over the next 50 years or so. It's not just climate change. It's sheer space, places to grow food for this enormous horde. Either we limit our population growth or the natural world will do it for us, and the natural world is doing it for us right now. "We keep putting on programmes about famine in Ethiopia - that's what's happening. Too many people there. They can't support themselves - and it's not an inhuman thing to say. It's the case. "Until humanity manages to sort itself out and get a co-ordinated view about the planet, it's going to get worse and worse." 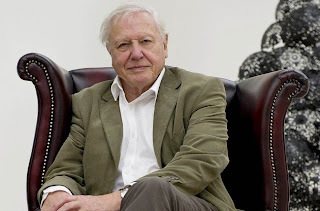 Sir David is a patron of the charity Population Matters, which aims to limit population growth through programmes such as contraception drives. Sir David, whose landmark series are being repeated on BBC2, also said that his style of presenting would soon be extinct. He told the magazine: "I'm not sure there's any need for a new Attenborough. The more you go on, the less you need people standing between you and the animal and the camera waving their arms about. "It's much cheaper to get someone in front of a camera describing animal behaviour than actually showing you (the behaviour). That takes a much longer time. "But the kind of carefully tailored programmes in which you really work at the commentary, you really match pictures to words, is a bit out of fashion now... regarded as old hat."